If you are a long time reader you know how I could wax poetic about my love for all things breakfast/brunch (waffles, biscuits and gravy, scones, quiche, muffins, frittatas, rolls, rolls, and rolls). Even though I wouldn’t really consider myself a morning person that first meal of the day takes the cake. I am not really sure where my love of breakfast comes from. Most mornings growing up we would have cold cereal or toast, which isn’t an impressive breakfast menu by any means. Sunday mornings were different though. We would get up early for church and sometimes there was freshly baked bread ready for us to inhale before we walked out the door. When we returned from church around 10 am and we would have a real breakfast. Eggs, sausage or bacon, and toast, sometimes there would be waffles. Sunday mornings would be the only time I would ever see my dad cooking in the kitchen. He was in charge of cooking the eggs and as far as my memory serves me his eggs were perfect every time. Today’s recipe isn’t Earth shattering or ground breaking or revolutionary. In fact I think McDonald’s may even have this breakfast sandwich listed on their Dollar Menu. While that may be true the golden arches doesn’t have anything on my egg (mc)muff. My mother-in-law frequently makes these for us when we stay there. She calls them Easier Risers and they always taste so good when she makes them. I ALWAYS use Bay’s English MuffinsÂ (they seriously are the best store bought english muffins) you can find them in the refrigerated section by the bagels and biscuit tubes. Sliced deli ham and sharp cheddar cheese top a perfectly fried egg. Use your favorite breakfast meat and cheese. That is what I love about these sandwiches you can quickly and easily make a different sandwich for every member of your family. In this version I sautÃ©ed garlic, spinach, and grape tomatoes in some olive oil while my egg was cooking. I topped my double toasted english muffin with bacon, fried egg, and the sautÃ©ed veggies. Everything got a sprinkle of black pepper and salty feta cheese. Â Delish! 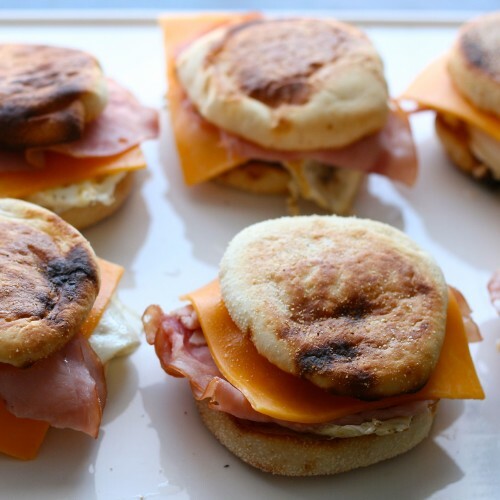 What I love about these English Muffin Breakfast Sandwiches is that you can make a whole bunch of them one day and freezer them for future breakfasts. I am currently 36 weeks along and I know I should be thinking about more freezer friendly family dinners but I really haven’t given them much thought. I have a couple freezer friendly breakfasts that I will be sharing this week, foods that will make it easier on me in the morning and that my daughters can pull out and warm up themselves. Thus making the mornings less hectic. Less hectic mornings are a good thing. Want to make your own English Muffins? I have a recipe for them too! 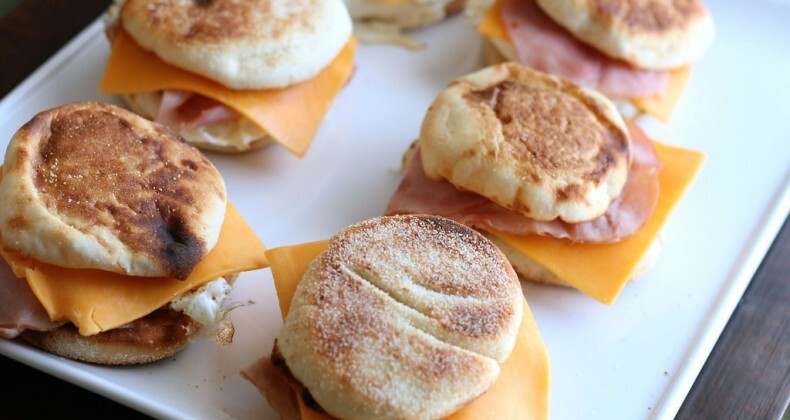 The reheated sandwich won't have the same crispy english muffin exterior as a freshly toasted one but it still makes for a quick, easy, and delicious grab-and-go breakfast. 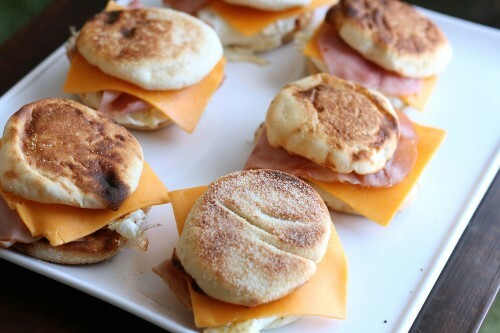 To assemble your sandwiches top the english muffin bottom with egg, meat, cheese, and the english muffin top. Easy peasy! Allow the sandwiches to cool completely. Wrap each sandwich individually with plastic wrap. Place the wrapped sandwiches in a ziplock freezer bag. Remove a sandwich from freezer bag, remove the plastic wrap, and place sandwich on a plate. Reheat in the microwave at 50% power for 60-90 seconds. 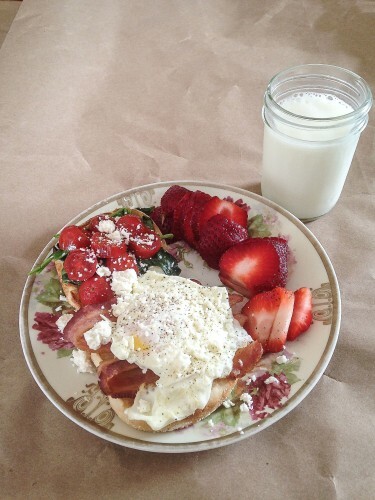 Thank you for a wonderful breakfast sandwich recipe that I plan to use right away. I love breakfast, but can’t stand to make it because I’m one of those who takes a long time to wake up! Your blog is lovely with lots of nice things to make. 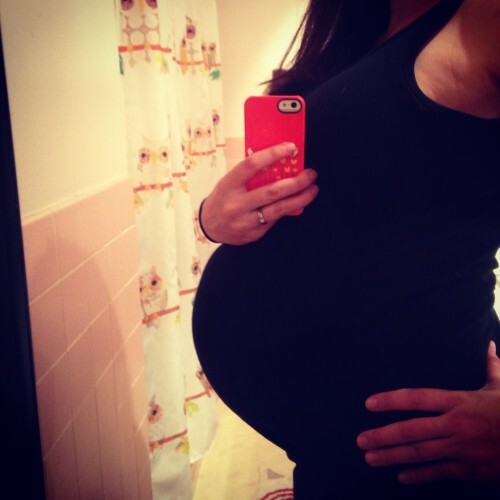 I wish you the best with your baby – how exciting! Garlic with your egg?! Ohh I’m so going to have to try that! I think the garlic and greens go so well together. An egg just makes it that much better!